Corey Himrod | Alaskawild Dec 20, 2018. 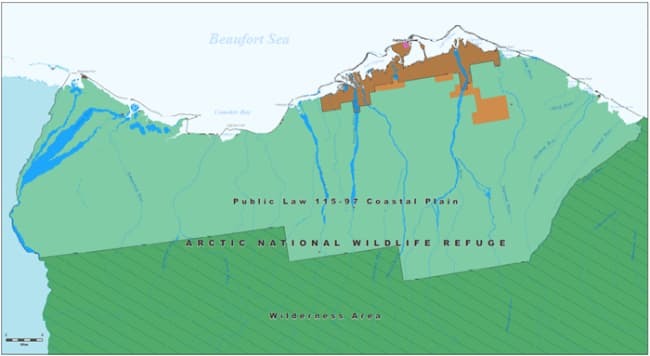 Washington, D.C. – The Bureau of Land Management has announced the release of its draft environmental impact statement (EIS) in advance of a planned 2019 oil and gas lease sale on the coastal plain of the Arctic National Wildlife Refuge. The publication of the Notice of Availability in the Federal Register on Dec. 28, 2018, will officially begin the 45-day public comment period. This process began with a public scoping period this summer during which the American public submitted nearly 700,000 comments in favor of protections. In addition, at public hearings held across Alaska and in Washington, D.C., public sentiment favored – often overwhelmingly so – protection of the Arctic Refuge and its coastal plain. Survey after survey shows the American people oppose Arctic Refuge development by a greater than 2-1 margin. Even as it looks to advance a deeply flawed seismic exploration proposal, the Trump administration is trying to advance a lease sale in the heart of the Arctic Refuge by next summer, years in advance of the legislative timeline and without sufficient time to gather and analyze data regarding the negative impacts drilling would have on the land and wildlife. During debate over the Tax Cuts and Jobs Act, Greg Sheehan, Principal Deputy Director for the U.S. Fish and Wildlife Service, testified regarding lease sales that ‘two would occur four to five years from now, with drilling being potentially as far out as 7-10 years.’ Despite promises not to undercut environmental laws, the intent of this administration is clear: beat the clock and rush oil leasing before potential shifts in the political landscape can occur. “There is simply no precedent for such a rushed, inadequate review of the impacts of oil and gas development in Arctic wilderness. BLM is relying on outdated and incomplete science to make its decision, a reckless approach that is flat out negligent when making a critical decision about whether oil and gas development should occur in one of the world’s most exceptional ecosystems. Drilling proponents like Lisa Murkowski have admitted wanting to get these leases out quickly to make it more difficult to restore protections in the future. This is a land grab, pure and simple, and the individuals responsible care little about impacts to wildlife or the damage they would be inflicting on Alaska Native people whose subsistence depends on the Arctic Refuge. Sadly, the Trump administration still hasn’t seemed to comprehend the message Americans delivered on Election Day. More than 35 members of Congress who voted in favor of a tax bill that included Arctic Refuge leasing were defeated. Polls have shown that swing voters in battleground districts opposed Refuge drilling by a 64-23% margin. This continued rush to drill America’s largest and wildest refuge is deeply unpopular, morally wrong, and threatens to turn back the clock on clean energy progress.